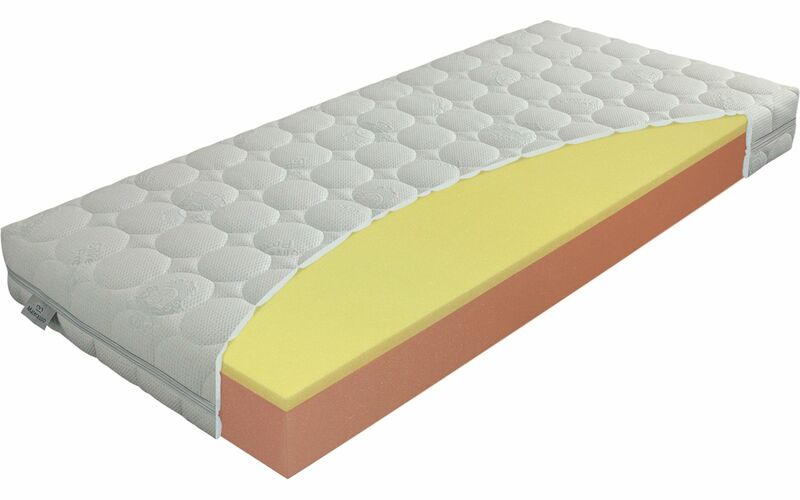 A luxurious sandwich mattress that combines two outstanding materials – viscoelastic lazy foam and comfortable Eliocell foam. The upper side consists of lazy foam, which maximises its firmness when in contact with the human body according to the absorption of heat and guarantees that the mattress can adapt to any load. It provides the body with perfect, even support. The underlaid layer of Eliocell foam is firm and excels at supporting the body. The luxurious Silver cover is wadded with a layer of viscoelastic foam. This prevents the production of harmful germs and bacteria. The quality, silver-ionised surface of the cover has anti-microbial effects and prevents the occurrence of mites. It is suitable for allergy sufferers and for a healthy style of sleep. SILVER stitched with viscoelastic lazy foam and PES fibre, grammage 100 g per square metre. The underside of the cover is wadded with PES fibre – grammage 300 g per square metre.